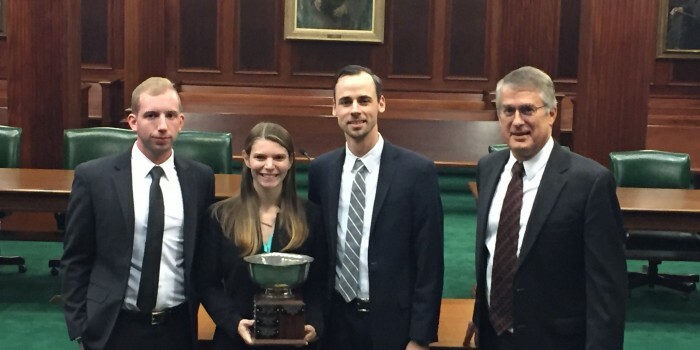 Wake Forest Law’s National Moot Court Team of Matt Cloutier (JD ’17), Mia Falzarano (JD ’17) and Blake Stafford (JD ’17) won Region IV of the National Moot Court Competition and the Best Brief award in a tournament held on Nov. 18-19 in Richmond, Virginia. The Wake Forest team earned the Best Brief award with a remarkable score of 97.25, nearly five points higher than the next best score and well above the average score of 83.3. No one running the regional tournament could remember a higher brief score. Stafford was the primary drafter of the team’s outstanding brief. Falzarano was the “swing” team member who argued both sides of one issue, while Cloutier and Stafford alternated on the other issue. Falzarano powered through a bout of food poisoning in Saturday’s three elimination rounds and did a great job with very hot benches. The judges in all the rounds had high praise for Falzarano and for either Stafford or Cloutier, explained Professor John Korzen (JD ’91), the team’s faculty adviser. In Richmond, the team went undefeated, winning all five of their matches. 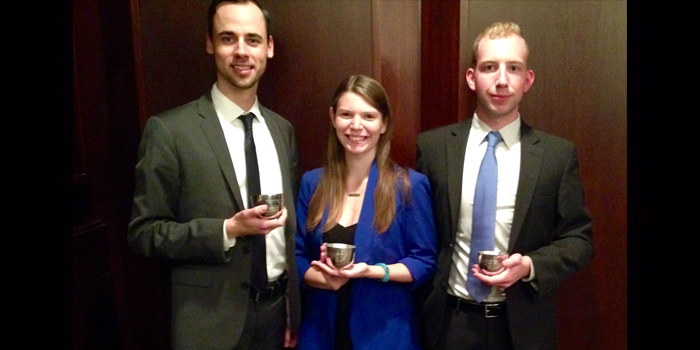 First they topped two teams from the University of North Carolina School of Law in Friday’s preliminary rounds. In the first round, the brief score (which counts 40 percent in this tournament) overcame a lower oral argument score. In the second round, Cloutier made an excellent rebuttal argument that drew praise from the judges and secured a better oral argument score. On Saturday, they topped a team from Campbell University School of Law in the quarter-finals, a team from William and Mary law school in the semi-finals, and a team from West Virginia University law school in the final round, with slightly better oral argument scores in all those rounds along with the higher brief score. The National Moot Court Competition is the country’s oldest interscholastic moot court tournament and one of the two largest. There are 15 regions in the competition, and the top two teams from each region advance to the national finals in New York City in February. Wake Forest Law has now “four-peated” as champion of Region IV (no other school has ever “three-peated”), which is even more impressive due to Region IV having by far the most teams of any of the 15 regions in the tournament. This year there were 21 teams in the region from 12 law schools. Other law schools fielding teams in the region included Duke, George Mason and Virginia universities. Professor Korzen and the team greatly appreciate the time and feedback of all their practice round judges. The practice round judges included Professors Maureen Eggert, Jaya Gokhale, Laura Graham, Rebecca Morrow, Charley Rose, Andrew Verstein, George Walker and Ron Wright; law school alumni Dylan Greenwood (JD ’13), Pat Kane (JD ’07), Kaitlin Price (JD ’16), and Gordon Widenhouse (JD ’81); and 3Ls Taylor Anderson, Nina Banfield, Kayleigh Butterfield, Drew Culler, Kyleigh Feehs, James Lathrop, Malorie Letcavage, Nicole Scallon, Daniel Stratton, and Paige Topper.